"Three Caspian Terns line up as the `leader` seems to give the order to `forward march!" 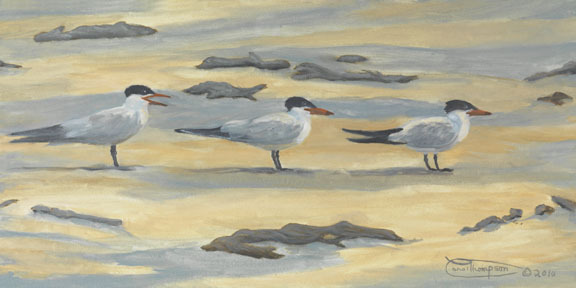 Artist comment: "This painting with oil on stretched canvas is one of a triptych of interchangeable canvas paintings that I did of Caspian Terns that visited the coast of Washington. They are fascinating in profile with their long beaks and sharply pointed tails. In this panel the one in the rear seems to be giving the order to his companions to `forward march`. I lined all three canvases up on my studio easle, and painted them alla-prima, making sure that the features of one lines up with each of the others. It was a fun challenge to come up with kookie titles for them." "Forward, March!" is a limited edition, giclée print from an original oil painting by Carol Thompson. The edition includes 3600 authorized, signed, limited edition prints (3500 numbered and 100 artist proofs). Release date is March 2016. Image size and substrates vary. All prints are signed and numbered by the artist and include a certificate of authenticity. Paper prints are shrink wrapped on foam board. Canvas prints are coated with a protective spray.